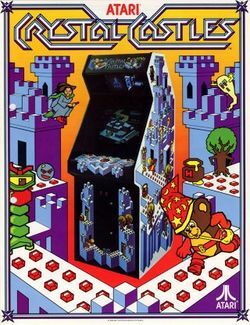 Crystal Castles is an arcade game released by Atari in 1983. It was released long after the stigma of appearing like a Pac-Man clone had worn off. It began development as a much different game, a variant of the Asteroids theme that would retain the 3D look that Crystal Castles ended up with. Much of the ideas for that game (intended to be called Toporoids) ended up in a different game, I, Robot, which was the first arcade game ever to contain filled 3D polygons. Crystal Castles became a more whimsical title, that also contained a number of arcade firsts, including a back-lit translucent track ball. Bentley Bear lives in a world of tree-dimensional perspective similar to that found in Q*Bert or Zaxxon, and he's the main character in what was one of Atari's most inventive games. Bentley's duty is to clear away all of the gems that cover the surface of each of the mazes, using elevators and ramps to cross between higher and lower portions of the mazes. While picking up the gems, Bentley must avoid Gem Eaters, Nasty Trees, Crystal Balls, and a wicked witch. Only a little over 5000 units were ever produced for the arcade, including a wonderfully decorated upright cabinet, and a much rare cocktail version. 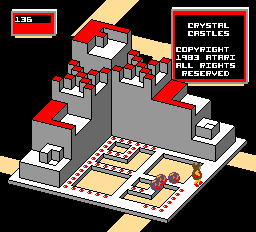 Due to the games appearance right around the time when the home video game market was crashing, Crystal Castles did not see as wide a variety of home conversions as it might have, appearing primarily on Atari systems, but making its way to other popular home computers, courtesy of Atarisoft. You control Bentley Bear with a trackball. You can make him jump by pressing the jump button. Your primary goal is to clear every stage of ruby gemstones. When the last gem is collected, you advance to the next stage. If you collect the last gem, you are awarded a bonus. If an enemy collects the gem, you simply move on. You must avoid contact with every enemy that occupies the stage. If you remain on a stage for too long, a swarm of bees will fly down to chase you. A pot of honey can be collected for bonus points. A magic hat can be collected for limited invulnerability and the ability to kill the witch. There are 37 stages in all, and three hidden warps allow you to advance quickly to higher stages.